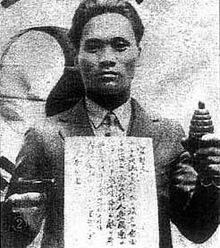 On this date in 1932, the Japanese shot Korean Yoon (or Yun) Bong-Gil for bombing a parade dais in Shanghai. A parade to celebrate the emperor’s birthday may be standard enough fare on the home front, but in a China being swallowed by said emperor’s empire it was a provocative act. In the first months of 1932, Japan had merrily exploited — or incited — anti-Japanese incidents in Shanghai as pretext for an imperialist mini-war, won handily by Japan. 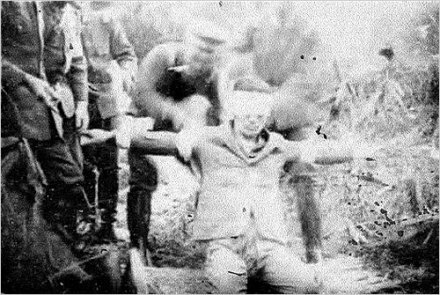 When the aggressors presented their celebratory pageant of arms in the city’s Hongkou Park (today, Lu Xun Park), our young Korean terrorist* “threw a narrow tin box high in the air. In an ear-splitting roar, the grandstand flew apart like a mechanical toy.” (Time magazine, excerpted in this useful Axis History Forum thread.) 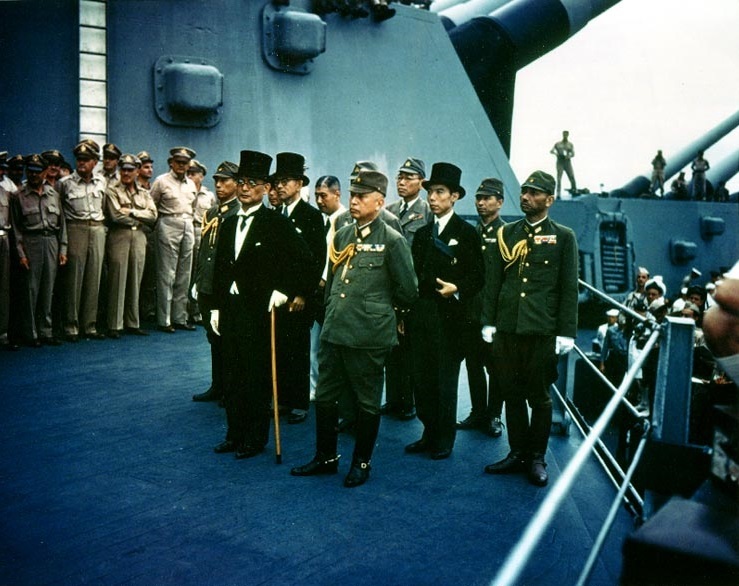 All seven of the Japanese VIPs on the dais were casualties, and two of them died: one instantly and another succumbing to his injuries a month later. “A young Korean patriot has accomplished something tens of thousands of Chinese soldiers could not do,” remarked an admiring Chiang Kai-shek. Coming just months after another Korean activist had taken a whack at Hirohito in Tokyo, the generalissimo couldn’t help but appreciate his brothers in resisting colonization. For this accomplishment Chiang would later go to bat for postwar Korean independence. But for his part, the patriotic Yoon got only a free trip to Japan for military trial and execution. When calling in Seoul, drop by a well-appointed memorial hall dedicated to Yoon’s memory … or, at the national cemetery where Yoon’s remains were repatriated in 1946. Mamoru Shigemitsu aboard the USS Missouri. * Note: calling Yoon Bong-Gil a “terrorist” is controversial in Korea. We use the word without moral censure. ** Mamoru Shigemitsu had been Japan’s ambassador to China at the time of the assassination bid.